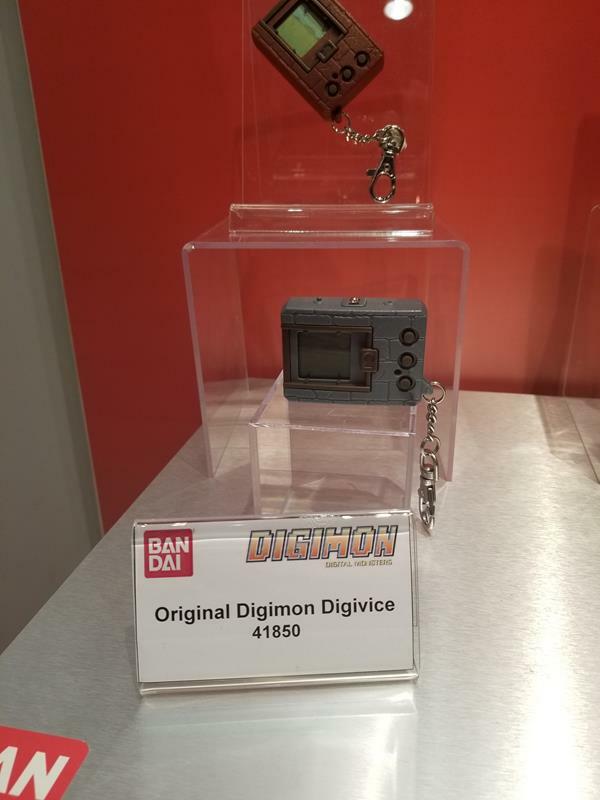 First there was listing at an Indonesian import shop under the name 'Digimon Original' and then a bit later Gamestop began to take pre-orders in store under an Assorted Digivice listing. 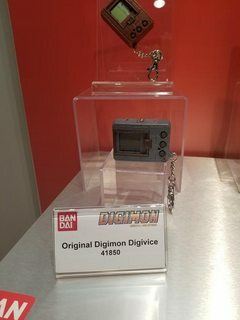 On display at Toy Fair, along with a few Tamagotchis, was a display for Digimon V-Pets, with the 'original brown' and 'original gray' colors, which were used on both the original V1 and recent Version 20th V-Pets. The Indonesian listing also had yellow and blue colors listed, so we will see what ends up happening colorwise for these. We can also see the old style English V-Pet logo on the wall, and the anime style logo on a placard. 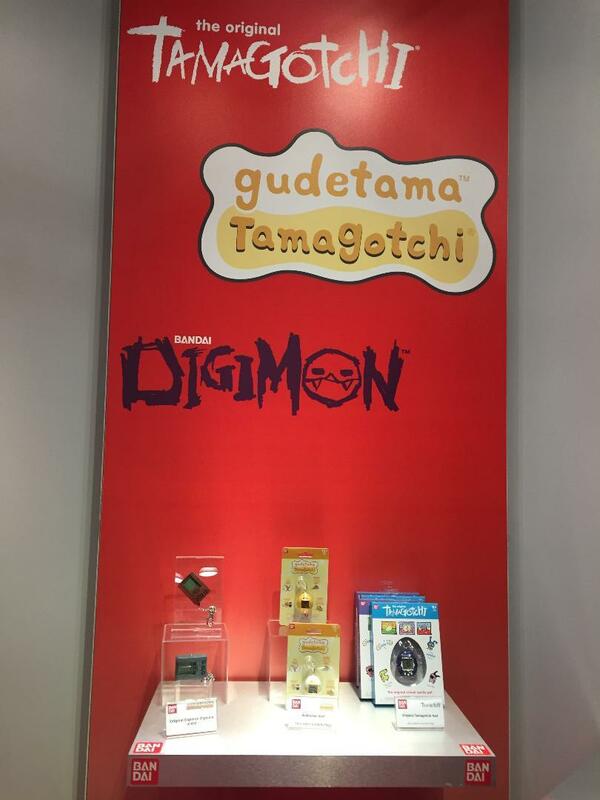 The placard, while hard to read, appears to say 'Original Digimon Digivice', which would seem to further clear up the Gamestop listing. Based on the information provided by Bandai, the new V-Pets will be very similiar to the original, with a handful of new, unspecified, features added, and are planned to launch this fall. It 'appears' the specific V-Pets on display were the Version 20th models released a few years ago, but at the moment it isn't clear if these are English releases of those, or if they were just used as display models at Toy Fair. The Gamestop listings are priced at $20 each, and the Indonesian listing was priced around there also. The recent 20th V-Pets in Japan were priced around $40. No doubt we will get more info on this soon hopefully. Thanks to Tama-Palace for the info and image and MaireadRalph for the heads up. Update- An additional closer up image from popculturenetwork. Thanks to GK45 for the heads up. Neeto, I had been just joking but it sounds like we might actually be getting 20th versions after all. I think I remember people being surprised by the Pendulum 20th being mostly English. I had assumed at the time that it was just because they were more aware that foreign markets were importing them. Maybe the reason was that they planned on releasing them in the US Market. https://i.imgur.com/tNJJG6u.jpg Click the link for larger image. Last edited by GK45; 02-25-2019 at 08:00 PM. It's also possible these look identical to the v20th because they're reusing parts. The Tamagotchi P1 & P2 reissues are recreations with new molds (and CR2032 batteries). Just speculation, but they might be working from that tooling since the molds already exist. Any speculation on what features might differ? I think the Tamas went for accuracy. I was thinking maybe the solo battling feature or the naps, especially since they would already have those designed if they're stripping the v20ths down to a 'New v1'. Awesome to get some additional confirmation they are coming this way. I am curious to see what changes they make in the final version, if any. Nah, the original Pendulum menus were all in English as well, it wasn't exclusive to the 20th Anniversary releases. Ah, my knowledge is limited as I'm not really into Vpets. Still going to grab one or two. Want more Digimon coming over here.